New World Notes: Is It Time To Stop Drinking Coke? Is It Time To Stop Drinking Coke? Note to radio stations: This page is going up earlier than usual. The installment you want might be on the previous page. The installment on this page debuts in Hartford on July 15. A manufacturer's dream: remove those pesky union organizers with your own death squad! 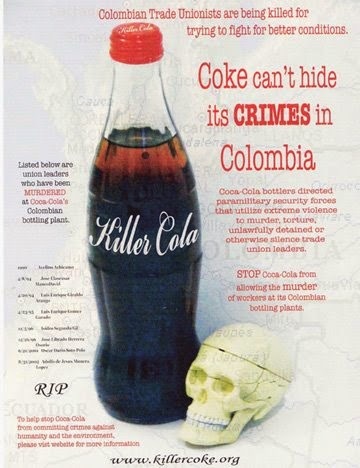 Coca-Cola's bottlers in Colombia have done this for years. Here's the story in prose (by Julian Borger) and song (by David Rovics). 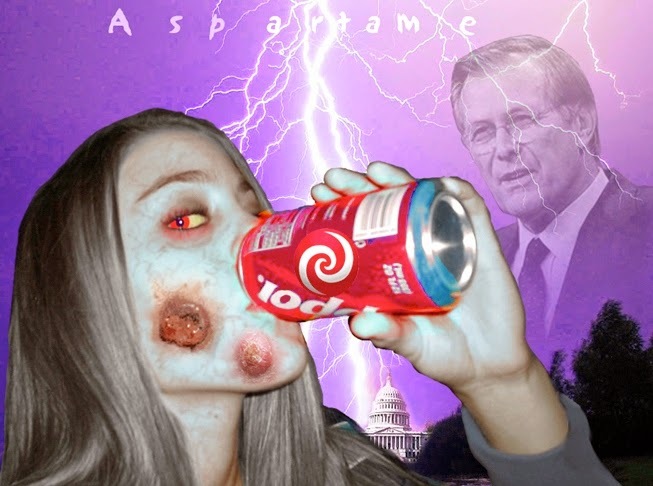 If you'd prefer to die more slowly, try drinking a whole lot of Diet Coke--or any other food containing aspartame (NutraSweet). James Corbett explains. Fun Fact: What do NutraSweet & the Iraq War have in common? Donald Rumsfeld! This installment is a repeat of NWN #75, broadcast in August 2009. 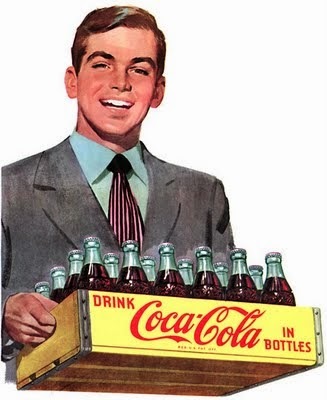 The show discusses a 1971 Coke commercial titled "Hilltop." A video is here. Lest we forget: "Coke" and "Coca-Cola" are registered trademarks of The Coca-Cola Company. You put James Corbett of the Corbett Report on your show. This guy is an unabashed Climate Denier. He always comes across as matter-of-fact and always appears to be well-researched. I very much appreciate his Aspartame stance and most others. However, he never ceases to amaze me with his Climate Hoax refrain once every several episodes. Climate Science is Science, not belief or opinion-based. No, it cannot predict with arbitrary precision. That is in fact impossible. It has, however, a very good grip on the highly probable near- and long-term changes to come. Also, your show's focus comes across as schizophrenic when you have James Corbett follow Guy McPherson, although to be fair they discoursed on completely different topics. Can you please use your influence, for James never responded to my email to him, to take him to task on his beliefs. (I meant to say beliefs). He is misleading people into a dangerous corner of complacency. Guy McPherson is another animal entirely. He overstates the worst case, which is nevertheless quite bad and may spell the death of us all, albeit taking slightly longer to do so than he claims. Has he not heard of band saturation, the lessening of the effects of additional greenhouse gases with increased concentration? He also calls the Amazon Rain Forest the "lungs of the planet". Heck, we all did until we realized it's the oceans that actually accumulate carbon on a large scale and that the Amazon is in fact a formidable carbon store. Thus, we probably should not slash and burn it all down. The oceans continue to subduct carbon and incorporate it into mineral substrates, but the Amazon stores the carbon mostly in the above-ground plant matter, not so much in the soil. Not true elsewhere, such as in temperate forests and wild grasslands. If his point is we should not cut them down, well, then, I'm aboard. I think seriously science-minded people need to take him to task firmly but with understanding so that he is not dismissed for his errors, which are small compared to his overarching message. There is an excellent University of Chicago lecture series which I wish they would offer up for sale. It is the class "PHSC 13400". I watched all 23 lectures even though I "understand" and "understood" the science behind Climate Change. This open lecture series is the best treatment I have ever seen on the subject. I can only hope they would grant you permission to publish audio clips from the lectures. Thank you for your contribution, Anonymous. Apologies for taking so long to approve its posting--I've been out of town. You are correct that James Corbett is a (long-standing) climate-change denier. He has so far failed to persuade me that climate change is a hoax. New World Notes has never broadcast any comments by Corbett on that subject. I think he has said some perceptive and true things on several other subjects, though--among them psychopathy, propaganda, and the history of aspartame. So I try to use his commentary--and everyone else's--judiciously.